Alexandra N. Delinick grew up in New York City and attended the Bronx High School of Science, then went on to receive her Bachelor in Honors Curriculum from Hunter College, City University of New York. 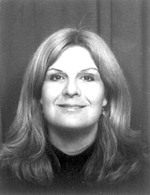 She then attended the Aristotelian University Medical School in Thessaloniki, Greece and received her medical degree. In 1987 George Vithoulkas asked her to be his assistant in order to help him on a book he was writing at the time and she was his assistant until 1999. She went to Greece to meet George Vithoulkas because she was dissatisfied with how conventional medicine handled chronic pathologies. This was especially evident to her during her stay in Boston, at Harvard University Medical School - Judge Baker Guidance Center. Then around 1990-1 she started working at Vithoulkas� Center of Homeopathic Medicine in Athens. She became Research Director of this center and the Hellenic Medical Homeopathic League and was elected General Secretary of Research for the LMHI or International League of Medical Homeopaths from 1995 to 1998. She was also Executive/Science Editor of the �European Journal of Classical Homeopathy.� In July 2002 she was given the chair/professorship in the School of Homeopathic Therapy at the NSA �Vassil Levski� University in Sofia, Bulgaria. Along with another professor she was instrumental in writing a Bachelor of Science and Master of Science Program in Homeopathic Therapy for the university. The Master of Science course in Homeopathic Therapy gave accredited Master of Science diplomas to medical doctors. The program was discontinued in 2005. She is currently treating patients as a classical Homeopath in Greece and is involved in doing basic research into the properties of homeopathic dilutions in a major university in Greece. Dr. Delinick hopes that some day conventional medicine will adopt some key notions from Homeopathy. Her hypotheses/theories on what happen during the potentization process in the homeopathic dilution and how this affects the organism have been given positive reinforcement and credence by other scientists who agree with her or quote her theories as explaining what is happening in their experiments. She continues to work as a Medical Homeopath and sees patients at her Maroussi, Athens, office. You can get in touch with her through her e-mail alex.delinick@gmail.com and by telephoning her at (+30) 210 2840 601 and (+30) 6944 546 332.